Within our education program, please consider activities available in the following areas: schools, homeschoolers, children's workshops, birthday parties, scout & 4H programs, plus harness racing opportunities for youth through the HHYF. Take lessons out of our book and race to the Harness Racing Museum & Hall of Fame for an educational adventure your students will always remember. Our innovative school programs use the American Standardbred horse and the sport of harness racing to illustrate concepts in mathematics, history, science, language arts and more. The museum is located in the historic village of Goshen, NY, known as “The Cradle of the Trotter” for its origins in the sport of harness racing and America’s first national pastime. Within our museum are many examples of local, state, national and international history and art; artifacts dating from harness racing’s beginnings to modern times; hands-on and interactive exhibits, a 3-D harness racing simulator, a chance to see real horses train at Goshen Historic Track located directly behind the museum and more. These resources offer students of all ages the opportunity to expand lessons presented in the classroom in a unique an unforgettable way! Duration of programs is approximately two hours, except where noted. Each program is $4.00, except where noted. Have a great time with the kids and create something unique at our Family Workshops! With a different theme reflecting the season or Holiday, children enjoy creating a horse-themed craft at our museum. Families had made fun crafts such as a carrot-shaped treat basket, horse mini-pillow and lucky horseshoe beaded necklace. 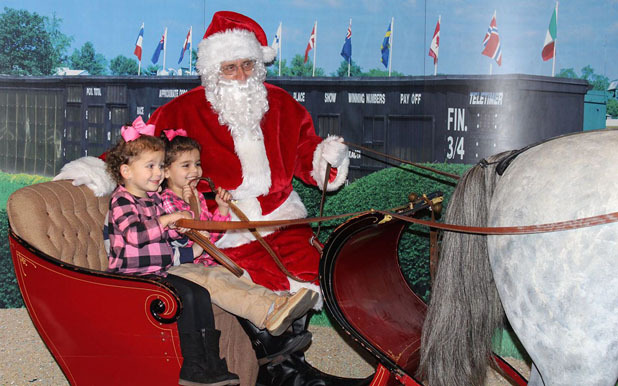 Afterwards, families enjoy a special mini-tour of the museum, kids participate in games and everyone has a chance to take a ride on our Harness Racing 3-D Simulator. For children ages 3-12. These workshops fill up fast—reservations are recommended. Call 845-294-6330 or e-mail [email protected] to sign up today. We take a hands on approach to a fun and educational experience. Our two-hour package includes set-up, beverage, paper goods, party favors and clean-up. Our friendly staff members conduct each party and are on hand for any questions. Every party also includes a brief tour of the museum and a ride on the WORLD'S ONLY 3-D HARNESS RACING SIMULATOR, as well as a bit of HORSING AROUND GAMES AND CRAFTS. Parties are 2 hours long and include your choice of three games and one craft. The "Thrill of Harness Racing" 3-D Simulator ride is included in all parties. For safety reasons, any children under the age of 4 must remain on stationary seats. Our games are all horse-related and designed to be both fun AND educational. Our crafts are also horse-related and vary from painting a real horseshoe to making a beaded horseshoe necklace, or painting a wooden horse magnet. We use washable paints and all non-toxic materials. We can combine parties for twins, brothers and sisters, and other family members. We can accommodate up to 25 children. This size limit maximizes the fun and learning for each child. The "theme" of all our parties is Harness Racing and Horses. To ensure continuity of the party program, no other themes are used. Our parties have been well-received and highly recommended among parents ever since Spring 2001, when we began to offer the parties through our Education Department. Most importantly, the children have a great time! "It is a great place to have a birthday party and so hassle-free." "We were all very impressed and had a great time. Thank you!" "I think the hospitality and professionalism was excellent." "It was a lot of fun for the kids." "The party was absolutely wonderful. The staff was so helpful and courteous." "The party was well-planned and kept the children occupied." "The staff did an excellent job! We were very pleased." So, don't just have a party...have a fun, educational party at the Harness Racing Museum! Our educational programs use the Standardbred horse and the sport of harness racing as a teaching tool for boy and girl scouts of all levels. Each participant explores the museum to learn something new appropriate to his or her level. Scouts also receive a take-home booklet and patch, plus everyone makes a craft and takes a ride on the 3-D harness racing simulator. Cost is $6 per scout if 10 or more scouts participating or $8 per scout if less than 10 scouts participating. Siblings are welcome to participate at a reduced rate (no badge or booklet given).